^ Kierszenbaum, Abraham; Tres, Laura. Histology and Cell Biology, An Introduction to Pathology 3rd. Elsevier. 2012. ISBN 978-0-323-07842-9. ^ Paulsson M. Basement membrane proteins: structure, assembly, and cellular interactions. Crit. Rev. Biochem. Mol. Biol. 1992, 27 (1-2): 93–127. PMID 1309319. doi:10.3109/10409239209082560. ^ Liotta LA, Tryggvason K, Garbisa S, Hart I, Foltz CM, Shafie S. Metastatic potential correlates with enzymatic degradation of basement membrane collagen. Nature. March 1980, 284 (5751): 67–8. PMID 6243750. doi:10.1038/284067a0. ^ Kubota Y, Kleinman HK, Martin GR, Lawley TJ. Role of laminin and basement membrane in the morphological differentiation of human endothelial cells into capillary-like structures. J. Cell Biol. October 1988, 107 (4): 1589–98. PMC 2115245. PMID 3049626. doi:10.1083/jcb.107.4.1589. ^ Henig, Robin Marantz. What’s Wrong With Summer Stiers?. New York Times. February 22, 2009. ^ Janeway, Charles; Janeway, Charles A. Immunobiology 5th. Garland. 2001. ISBN 978-0-8153-3642-6. Kefalides, Nicholas A. & Borel, Jacques P. (编). 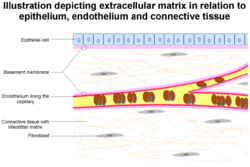 Basement membranes: cell and molecular biology. Gulf Professional Publishing. 2005. ISBN 978-0-12-153356-4.